Last night I went to see Elton John in Norfolk, VA. My first time. In all my years of concert goings and in spite of being married to MrPeachez who produces and promotes such events, I had never been to see Sir Elton. 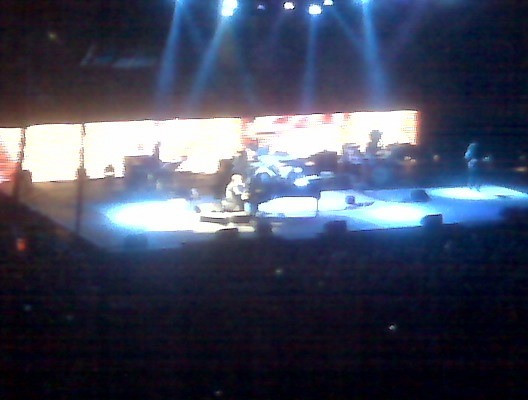 That blurry blackberry image is Elton on stage last night. 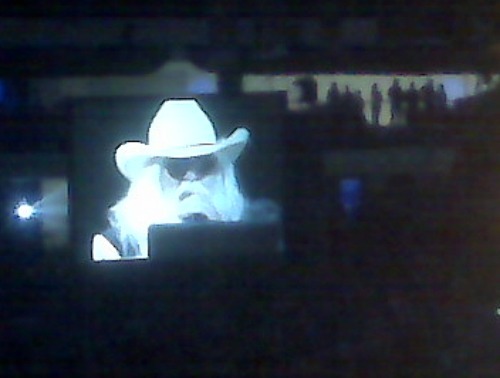 BUT the evening was resplendent when Elton was joined on stage by another legend, Leon Russell. Their recent album, THE UNION is beyond fabulous. I've been a fan of Leon for years, and well, who doesn't love Elton John? The concert was just fabulous, absolutely fabulous. Glad to hear it was good. We are going on Friday! Oh ya gotta love Elton. Buh buh buh buh Benny and the Jetssssssss! Back in the late 70s,that was the first question my future husband asked me when we met in high school… “What do you think of Elton John?” Little did I know my whole future relied on my answer! Since then I’ve been to lots of Elton John concerts with his #1 fan. Always fun.